Tour traffic is something we've found to be very important for your clients and their clients (home sellers). Seeing how popular their home is and how much traction it is getting in the market can be so impactful. Because of this, we have a graphical statistics e-mail that goes out weekly or monthly, at your preference, to your client as well as anyone else they'd like it to go to. Click here for an example of what one looks like. Statistics are counted from the day the tour is delivered. To keep the numbers true and not inflated, if you are logged into TourBuzz, we will not count your views. 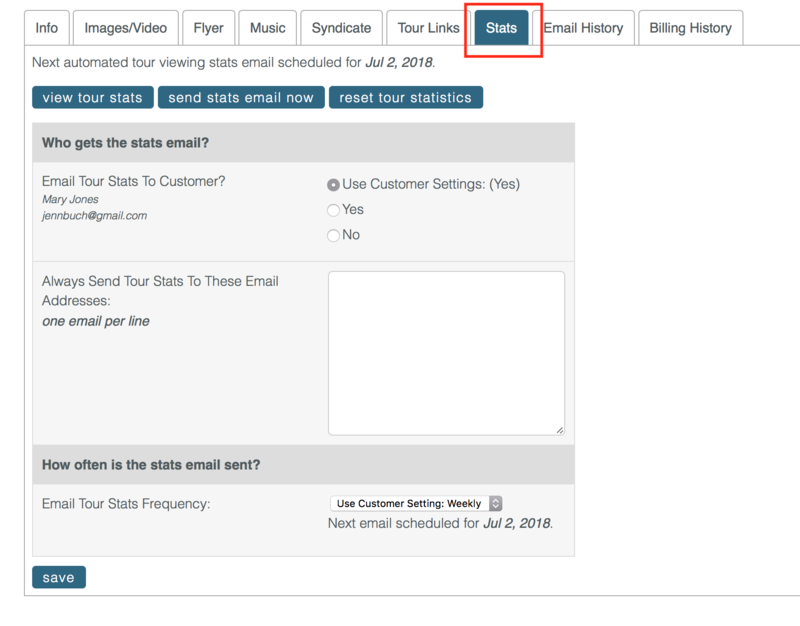 Views are only collected from those that are not logged into Tourbuzz. These email reports are sent 7 days after the tour is delivered, and every 7 days thereafter. You cannot set a time and day to send the statistics reports. Statistics can be reset for a given tour in the Edit area of the tour on the Stats tab. Click here for detailed instructions on how to do this. Here is the explanation of the information on the email reports. Total Photos viewed: All the individual media types, still images, panoramas and videos, that have ever been viewed for the life of the tour. Total Tour Views: This is the number of times the tour has been viewed. Total Tour Views and Total Visitors will differ based on the number of times a visitor viewed the tour on a single visit. The same person can be a New Visitor if they close the tour and return after 30 minutes. They will additionally be classified as a Repeat Visitor. Total Visitors: Total number of all Visitors to see the tour. Visitors are anyone that clicks on the tour link. Images Viewed per Visit: The average number of images viewed per Visitor. We count images until the viewer leaves the tour page or the tour stops running. Popular Images: The number of times an individual image is viewed. Total Traffic Last 7 Days: Total Traffic refers to the total number of tour views in a given day. This is the last trailing 7 days. Total Traffic Last 8 Weeks: Total traffic per week is based on the number of tour views that take place Monday through Sunday. It does not matter which day the tour was published, ie. the first weeks traffic will probably not be a full 7 days. Referring Sites: This is a list of sites where the visitors clicked on the tour link. Direct visitors are those that came via email or other links we cannot track. Repeat Visitors: Someone using the same computer with the same browser returns to view the tour at least 30 minutes after the first time they viewed the tour.